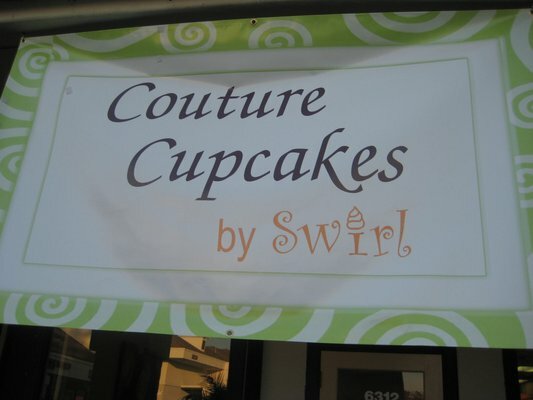 Local Orange County Cupcakery to be Contestant on Cupcake Wars! My very own local cupcakery, The Perfect Circle, will be competing on this season of Food Network's "Cupcake Wars!" Several months ago Alyssa, the owner of TPC, hinted that something big would be happening. I predicted that this was what she was hinting about and I was right! 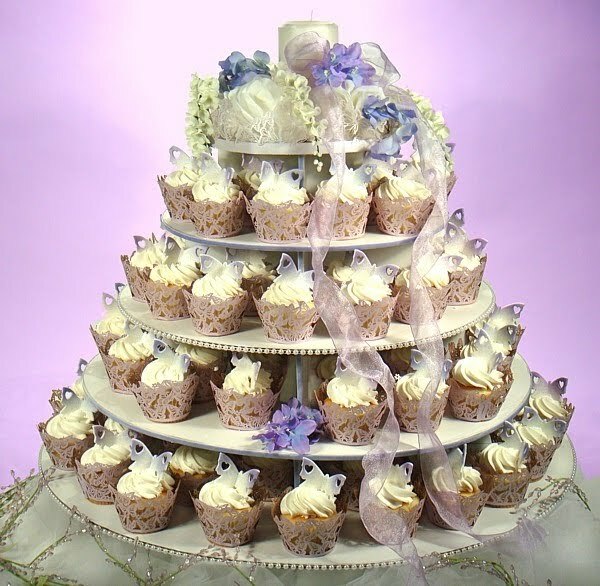 The Fast Food Maven reports that this season of Cupcake Wars will begin on June 15 with two bakers from Southern California -- Dollhouse Bakeshop Shoppe in Santa Monica and Milk in Los Angeles. 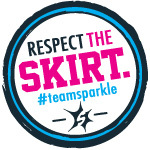 The contestants are competing for $10,000 and a chance to show their cupcakes at a high-profile event. Each show will have a winner. Alyssa Magliato will be on the June 29th show and will compete against The Coffee Shop of Gilbert, AZ, Cupcake Charlies of Mashpee, MA, and Sweet E's Bake Shop of Los Angeles. June 15 9:00pm ET/PT (Season Premiere) "SeaWorld Birthday Bash"
Milk (Los Angeles, CA) - I have been here yet, but I've been dying to go! June 22 at 10:00pm ET/PT "Match Making Party"
Crushcakes Cupcakery (Santa Barbara, CA) - I just reviewed their shop last month. June 29th, 10:00pm ET/PT "Ace of Cakes 100th Episode Celebration"
The Perfect Circle Cupcakery - Obviously I know this place very well. Sweet E's Bake Shop (Los Angeles, CA) - Tried their cupcakes at LA Cupcake Challenge. They were also on the pilot episode of Cupcake Wars. July 6th, 10:00pm ET/PT "Survival of the Fittest"
Whodidly Cupcakes (Santa Barbara, CA) - Not sure how I missed them on my trip to Santa Barbara last month. 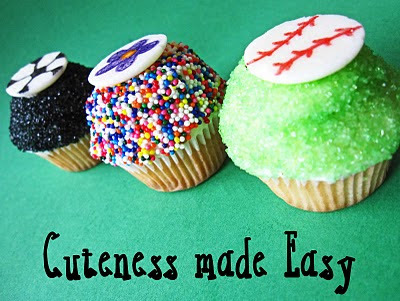 They were also on the pilot episode of Cupcake Wars. 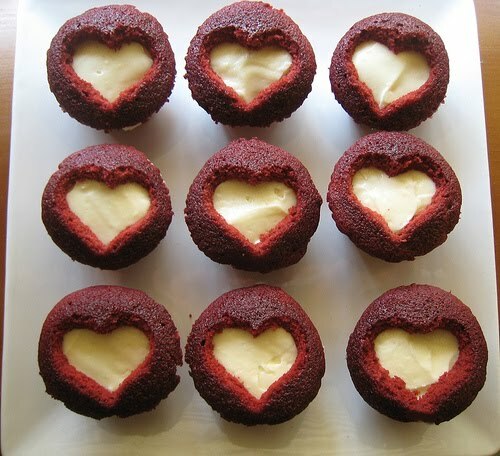 July 13th, 10:00pm ET/PT "George and Ann Lopez Charity Golf Tournament"
Southern Girls Desserts (Los Angeles, CA) - Tried their red velvet cupcakes at LA Cupcake Challenge a few months ago. Becker's Bakery (Manhattan Beach, CA) - They are close to my husband's work. Maybe I should have him stop by sometime soon! July 20th, 10:00pm ET/PT "Cupcakes for a Cause"
Kara's Cupcakes (San Francisco, CA) - Yum! 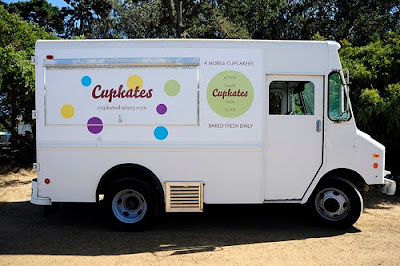 I loved eating their cupcakes during my visit to San Francisco last year! July 27th, 10:00 pm ET/PT "Film Festival Face-Off"
August 3rd, 10:00pn ET/PT "Classic Cupcake Challenge"
More info about the show will be available on May 27 at www.foodnetwork.com/cupcakewars. I can't wait to watch! What Would You do for a (Fried) Klondike Bar? I absolutely LOVE the Orange County Fair!! It's the one time a year where I allow myself to eat lots and lots of fried food and not feel guilty. Two years ago I tried a deep-fried cupcake. Last year I enjoyed a fried avocado, along with lots of other fried food and a normal cupcake. So what's going to be new on the menu this year? Food Frenzy has the inside scoop. Chicken Charlie's is the best stand for finding fried food at the OC Fair. They will fry practically anything. I like that attitude. Niyaz Pirani of Food Frenzy met with the owner of Chicken Charlie's to see what new items will be taking a trip into a deep fryer this year. 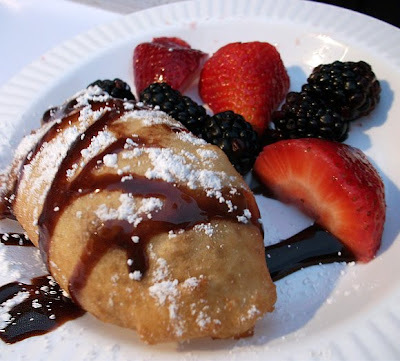 The food item I'm most excited about is the deep-fried Klondike bar! My first thought is probably the same as most of you, how can you deep-fry an ice cream bar? Answer: you freeze it at a very cold temperature (-25 degrees) and then eat it very fast. Sounds delicious! The deep-fried Klondike bar is not the only new item you might find at Chicken Charlie's. He's also been experimenting with deep-fried Reese's, deep-fried M&Ms, and deep-fried blackberries. I can't wait...see you at the fair! One of my family's favorite desserts is fruit pizza. You roll out cookie dough on a pizza pan. Bake it. Spread vanilla pudding as the sauce. Top with your favorite fruit. Utah Loves Cupcakes directed me to a blog called Cravings, which featured a Fruit Pizza Cupcake. Similar idea. The cake is a fruit cake (not sure what kind, but any should do well). Spread some pudding or frosting. Add a sugar cookie, along with more pudding or frosting. Top with your favorite fruit. Yum! Thanks for the idea! 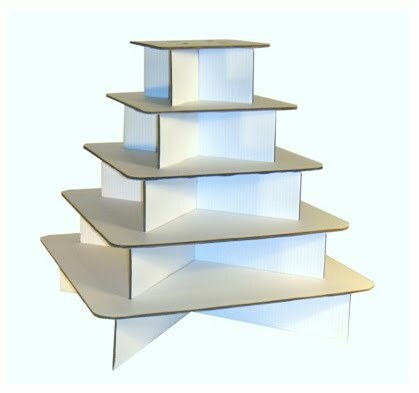 Don't miss your chance to enter to win an Eco-Cupcake Stand. Last day to enter is Sunday! Last month I confessed my love for food trucks and wished for a cupcake truck to come to Orange County. Maybe my wish is coming true. The Fast Food Maven is reporting that Morsels Baking Company will be cruising around Orange and LA county starting in June. This was the first I've heard about Morsels Baking Company. Apparently they are a dessert company and their menu includes: breakfast, cream puffs, cupcakes, desserts shots, bars & squares, and beverages. I'm intrigued. 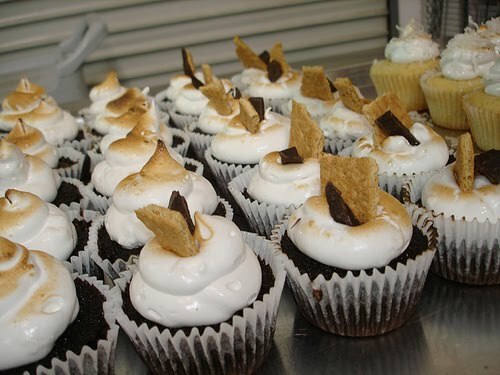 You can follow them on twitter (@bakerytruck) or catch them on Facebook. 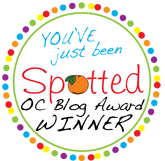 I'll let you know when I first spot them in Orange County. P.S. Don't forget to enter the giveaway for an Eco-Cupcake Stand. Entries must be received by Sunday. A few weeks ago I was in the middle of tax season and overloaded with stress. April 16th was my first day of freedom! I took advantage of the end of tax season by going on a weekend getaway with my husband to Santa Barbara. The weather was perfect! We had a great time relaxing, riding bikes, and running along the beach. Of course, what is a getaway without some cupcakes?! 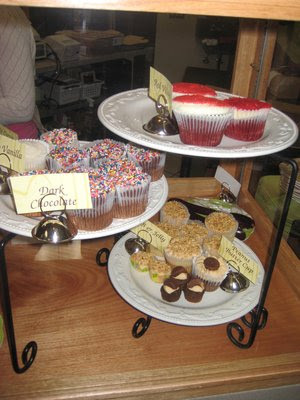 A little bit of research led me to Crushcakes Cupcakery, a cute cupcake shop near downtown Santa Barbara. The shop had a small area for waiting to order cupcakes. 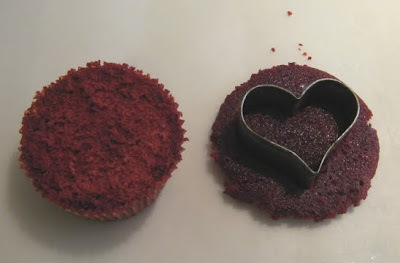 It had a very homey feel, a good thing since cupcakes are a comfort food. 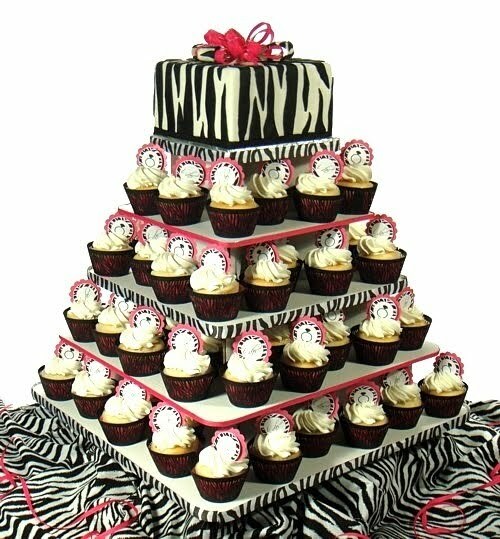 The small area was a bit of a problem because you couldn't see the cupcakes until it was your turn to order. 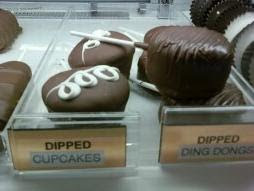 This didn't bother me because I always ask a million questions about each cupcake before I pick anyways. I couldn't leave without buying their signature cupcake -- the Crushcake: red velvet cupcake topped with chocolate heart dipped into signature sour cream frosting. 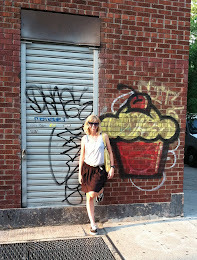 Of course I am smiling in this photo, I am about to eat some yummy cupcakes (although I didn't know they were yummy yet)! My husband and I devoured three flavors: Peanut Butter Cup (chocolate cake with peanut butter frosting), Crushcake (I already mentioned that), and Buttermilk Crumb Cake (buttermilk cinnamon swirl cake with brown sugar cinnamon frosting). The first things I always look at are the size and proportions. They were good-sized cupcakes, not too overwhelming and the frosting was well-proportioned to the cake. The second thing I check is the cake moistness. Good, although after tasting the cupcakes, we left the remainders in our hotel room for an after-dinner snack and they were semi-dry when we returned. Next, frosting thickness and taste. The frosting was thick and creamy, exactly how I love it. The sour cream frosting could have been a little bit more tart. Last, overall taste---yum! All three flavors were great. I loved the flavor combination of the Buttermilk Crumb Cake, a unique flavor that I hadn't tried before. Reminded me of the cinnamon bundt cake my mom used to make. The other two flavors were pretty standard. As I was leaving the store, the owner told me that the Coconut Cloud was their best flavor. Since I already paid for my cupcakes and I was in a hurry, I didn't get a chance to try. But if it's recommended by the owner, then you shouldn't pass it up like I did. I was so happy to find a cupcake shop in Santa Barbara that served good cupcakes. On your next trip to or through Santa Barbara, you should definitely stop by. 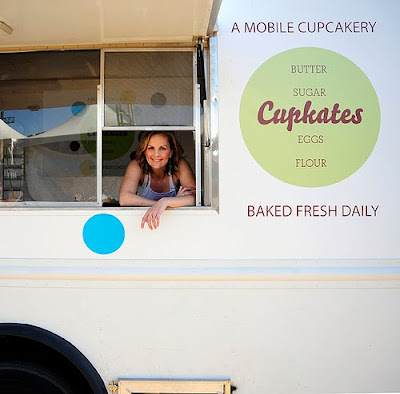 Rachel from Cupcakes Takes the Cake was recently in LA. Of course she stopped by a few cupcake shops, one of them being Yummy Cupcakes in Santa Monica. She posted pictures of her cupcakes, but also included pictures of cupcakes in a jar. I was intrigued by the cupcakes in a jar because I get so many people asking me about how to ship cupcakes. 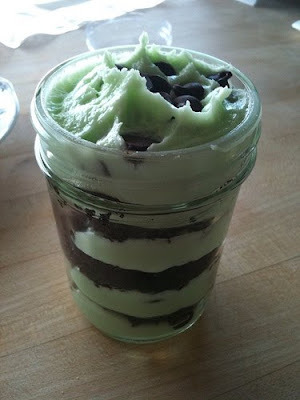 Last year I wrote about Beantown Baker's idea of shipping cupcakes in small mason jars. 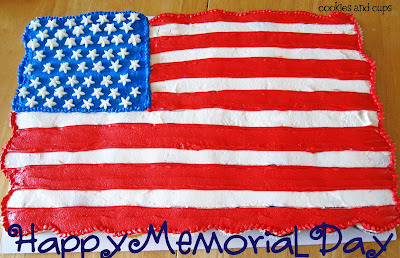 I even tried it myself when I participated in Operation Baking Gals. But Yummy Cupcakes makes it better by taking it one step further: layering. 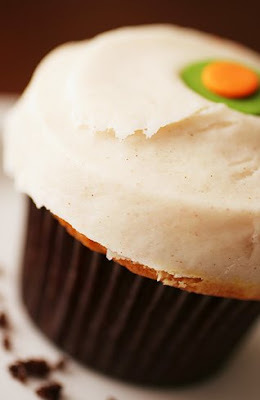 Looks like Yummy Cupcakes starts with a layer of frosting, then adds 1/3 cupcake cut horizontal, then more frosting, then 1/3 cupcake, then more frosting, then the remainder of the cupcake, then a bit more frosting. 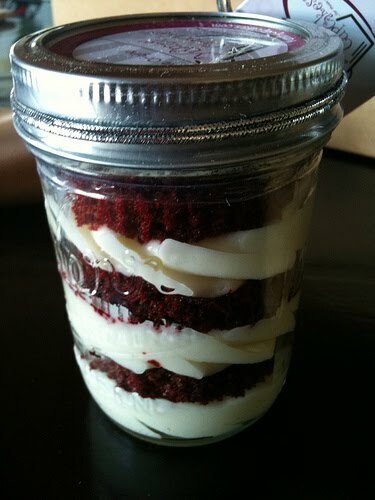 They also use large mason jars, instead of small ones, which allows room for more cupcake! And because the cupcake is dissected, it doesn't really matter that the cupcake doesn't look beautiful....the stacking of the cupcake and frosting give the cupcake a unique look. Like this! 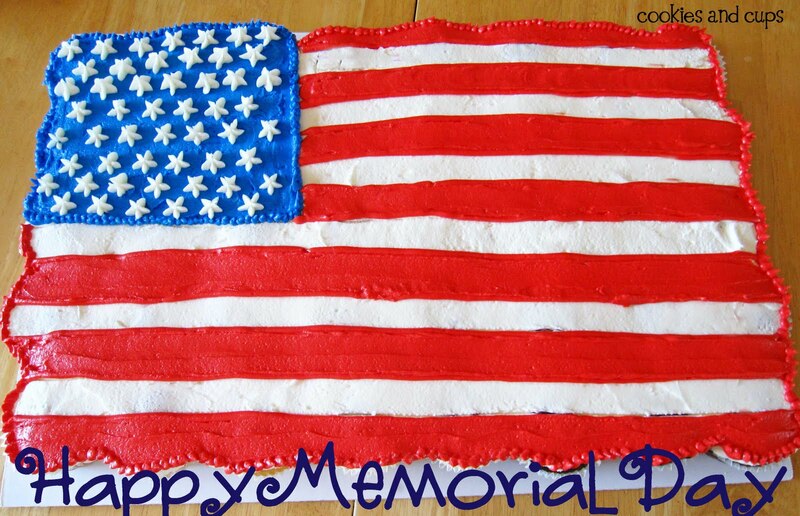 To get more info about ordering cupcakes from Yummy Cupcakes, check out their website.